Oriental's School of Sailing, located in historic Oriental, NC, sits at the cross roads of the North Atlantic amid some of the best sail training grounds in the world. Nestled at the opening of the Neuse River and perched on the vast Pamlico Sound, it is home to the best breezes, longest sailing season and by far and away the best sailing port of call in the Country. Sailing is a sport that everyone can learn and enjoy. Sails can be our wings to freedom. They can take us in search of adventure, and far away from the telephone, TV, and distractions of everyday, nine-to-five life. The 2019 Class Schedules are online, listed with each course. Select Basic Keelboat Certification to learn to sail, then later you can charter or take Basic Cruising or Bareboat Cruising to further advance your skills. Our program of instruction can teach you more in a week than you might learn in several years of sailing on your own. 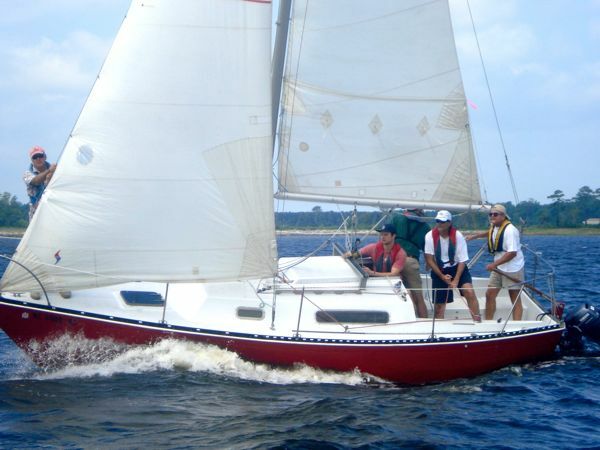 Come join us and learn to sail on cruising sailboats with instructors who want you to enjoy sailing as much as they do.